I hope you are enjoying St. Patrick's Day! No matter where you are in the world, you are likely to find those with Irish heritage and those who simply love the Irish and their culture celebrating today. St. Patrick's day is named for the patron saint of Ireland. 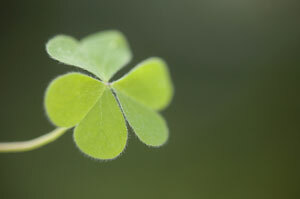 St. Patrick was born in Britain and taken prisoner at age sixteen. His captors took him to Ireland and sold him as a slave. He escaped after six years and returned home. In his writings, St. Patrick tells of his spiritual awakening which led him to return to Ireland to convert the people to Christianity. 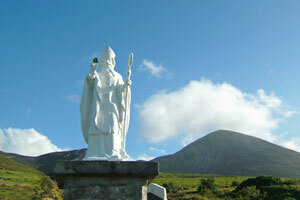 St. Patrick's name is associated with many historical and spiritual sites in Ireland. 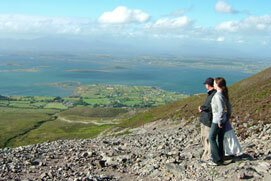 I remember my two outings to climb Croagh Patrick mountain near Westport. One was on a fine sunny day with my friend, Mary, and another was on a sunny day, turned rainy day, turned foggy and freezing day with my children Shannon and Molly. I'll tell more about that adventure on another day. Enjoy the rest of your day and evening celebrating St. Patrick and the Irish. I hope you are making plans to visit Ireland someday; it's a gorgeous place with wonderful people. In the meantime, visit my website for a taste of the Republic and Northern Ireland. You will find tips and advice for booking your trip and photos to enjoy while you wait. I look forward to seeing you again soon.